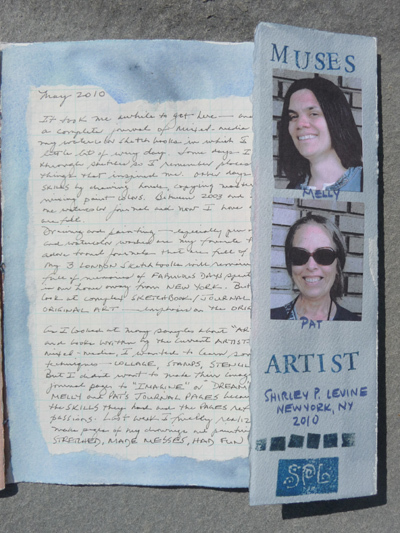 I am uploading the last 2 page spread, acknowledgements, and the back cover of my mixed media journal. It was a great project and I'm already making another one of these 8 X 10" watercolor paper journals, although I'm not sure how often I will work in it. Over the past several years, I celebrated my love of coffee while doing Every Day Matter weekly challenges. It seemed like the perfect topic to use to finish this play project. 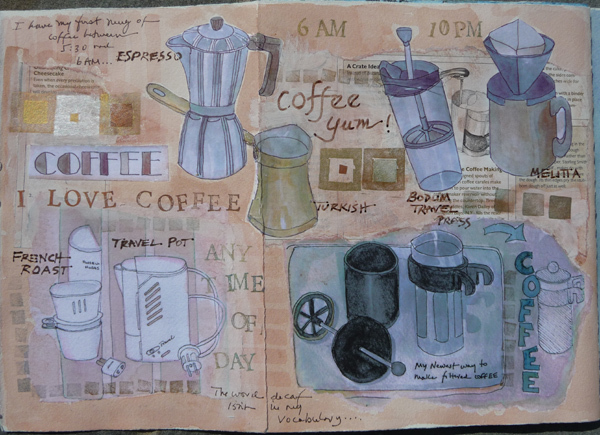 The collages were scanned, printed, and cut out from sketchbook pages that show how many ways we have to make coffee at home. The square stamp is actually 4 small square stamps of different sizes that can be combined using different stamp inks. I wrote myself a long note about the circumstances of this challenge by Melly and Pat, and my process and the fun that I had. I decided that I definitely needed to acknowledge my muses and used pieces of a photo of the 3 of us on a recent field trip to see Art Quilts at the Morris Museum. 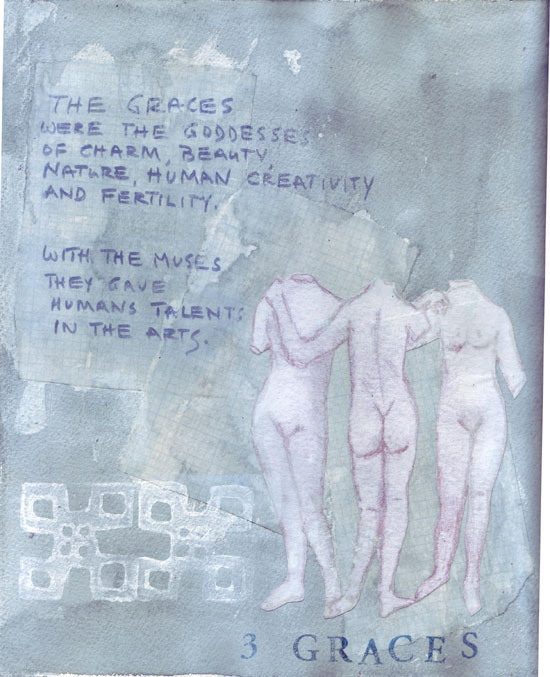 I looked up the 3 Graces and the mytholocial muses and decided that this was a perfect image for my back cover. I previously did the drawing in the Greek and Roman Galleries at the Met, and scanned, printed, and collaged it to this page. This was a fun project, and an interesting watercolor journal to use. I made it from Teesha Moore's YouTube video of the 16 page journal (really 12 pages plus flaps which are slightly narrower). 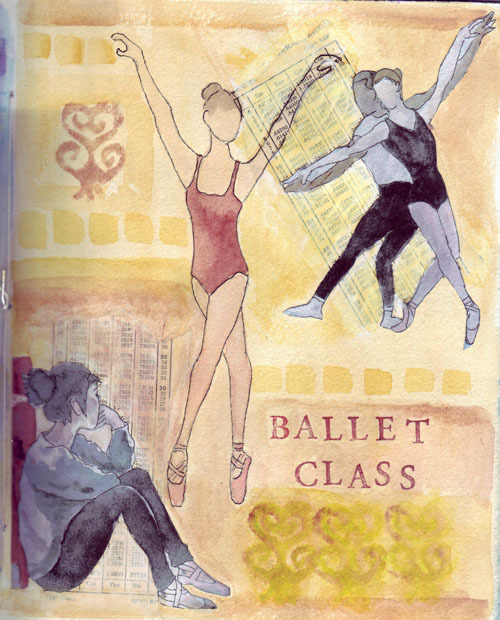 I have many sketches of ballet dancers in my journals - all from photos since I can't draw fast enough to catch them in action. This is a single page spread: the dancers on the top right and bottom left are collages of pages that were scanned, printed, and cut out. The dancer in the center was drawn on the top layer. This is another new stamp that I made. Next: A 3 page spread of Central Park Zoo animals with many, many penguins. All of the animals were collages made from prior journal pages made at the Central Park Zoo, except the penguins that appear right above the words "Lots of Penguins." Those were drawn on a top layer. I used pieces of a zoo map for the first layer of collage, Neocolor II watercolor crayons, gesso, acrylic paints, and stamps. 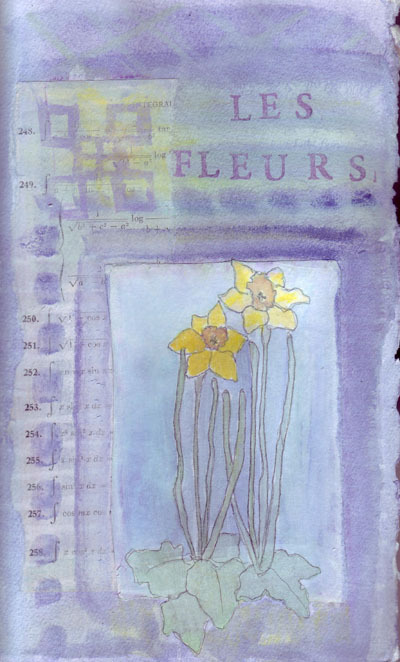 I posted this page several weeks ago - it is actually the first flap in the Teesha Moore 16 page watercolor journal - and when opened it leads to my full "Les Fleurs" page. The flower image was scanned from my sketchbook, printed in color, cut out and added as a collage. The stamp is one of the new ones I created when making this journal. This is a two page spread in the journal - the back of the flap and the next page. 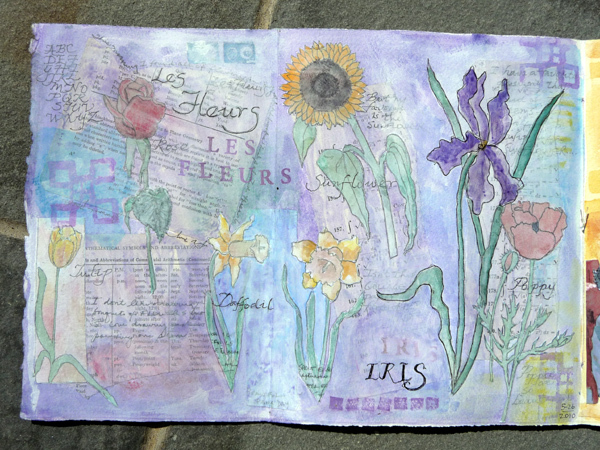 Each of the flowers except the iris were collages taken from sketchbooks. The iris was drawn onto the top layer when I was finishing the page. This is a photo because the page was too big for my scanner. I think I'm finally figuring out how I want to use my journals/sketchbooks. From the time I began this adventure and joined Every Day Matters, I've considered my sketchbooks as visual journals - sometimes used for practice, as when I did exercises from art books, or copied drawings of the masters, but most times used as a daily visual journal. I don't want to change that. 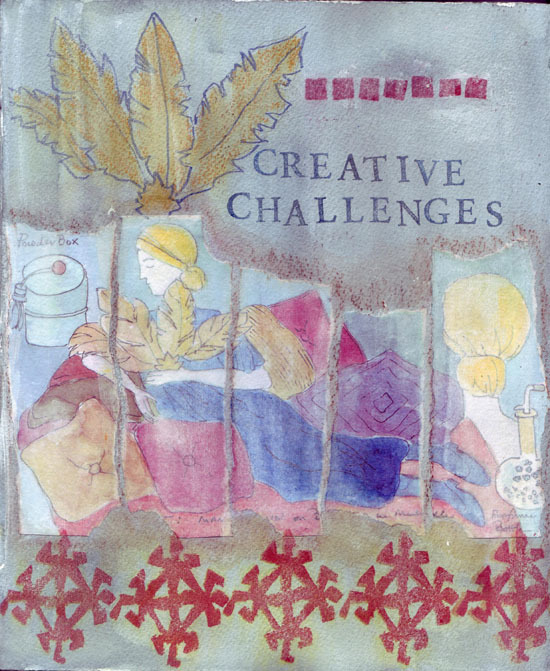 But making the mixed media journal allowed me to see that I can print previous sketchbook pages, and use others as inspiration for redrawing images, to be used in mixed media journal book pages or artwork that is separate. However, image resizing with Photoshop, a scanner, and a color photo printer are necessary and my dining room table was full of paints, brushes, gel medium, gesso, stamps, stamp pads, calligraphy pens, acrylic inks, Pitt pens, scissors, rulers, and exacto knives. If I'm drawing at home, I do my evening journal pages with my sketchbook, pencil case, waterbrushes, and travel watercolor kit on the couch - a much simpler process! I looked through my sketchbooks and decided that I had several drawings of my grand daughter Sydney that I would like to combine on a double page spread. I scanned and printed 3 images -two from her life in London as a 2 year old. The drawing on the top left was Sydney and her brother Henry (age 3) in Hyde Park when she insisted that he hold her hand. Right below it is a similar painting from Central Park, NYC from this year. On the far right is Sydney wearing a "dress-up" hat at the Victoria and Albert's Children's Museum in London. As you can tell, I'm most comfortable drawing my grandchildren from the back. 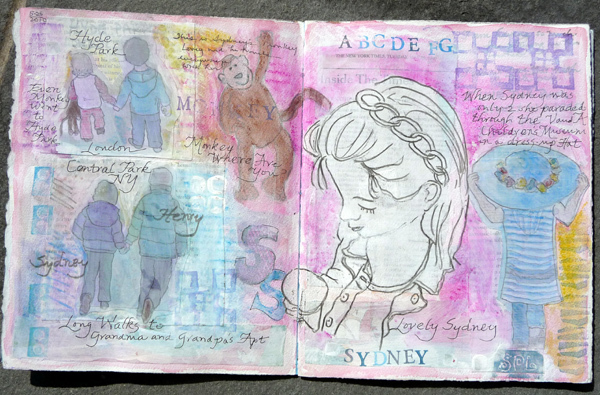 The monkey drawing was done right on this page, to celebrate her "lovey" who still goes places with her. You can probably see him in the drawing of her in Hyde Park as well. And the drawing of Sydney was also done right on this page - from a drawing I did in May as a Bert Dodson Exercise on drawing foreshortened heads. This page has lots of layers, including collaged text papers under my cut-out drawings, paint, gesso, stamps, waterproof ink calligraphy ink, Pitt pens, and more paint. My art buddies brought their sketchbooks to the Met when we went to see the Picasso exhibit and I told them how much I loved their mixed media pages. Melly said - try it, put more than one thing on a page. Pat said add layers, many layers. I had an 8 X 10" journal that I made from Teesha Moore's 16 Page Journal You Tube video several weeks ago so I decided to use it and to accept their challenges. However, I wanted to make collages from my own sketchbook pages and add at least one new drawing to each page. I pulled out all of my random art supplies and played for one week - just letting the pages evolve from printed sketchbook pages. Here is the front cover, and the first 2 pages. The collage painting on the cover was from the Poiret Fashion Exhibit at the Met and she reminded me of a muse. 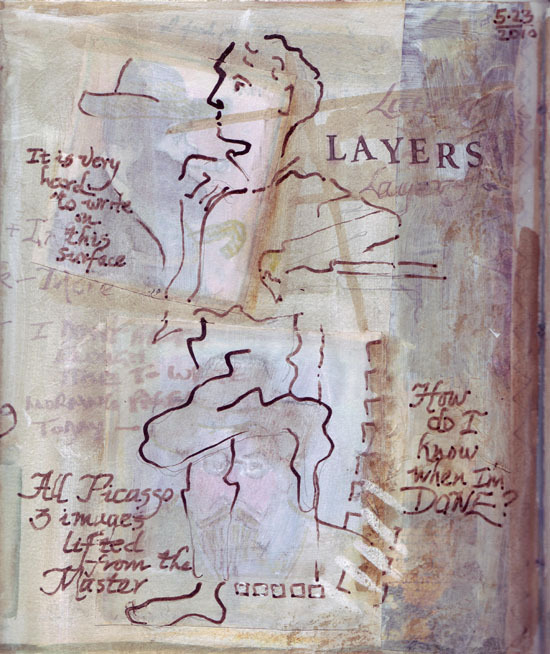 The Picasso page has several of his Barcelona artist caricatures collaged in one of the layers and a Picasso inspired drawing on top. 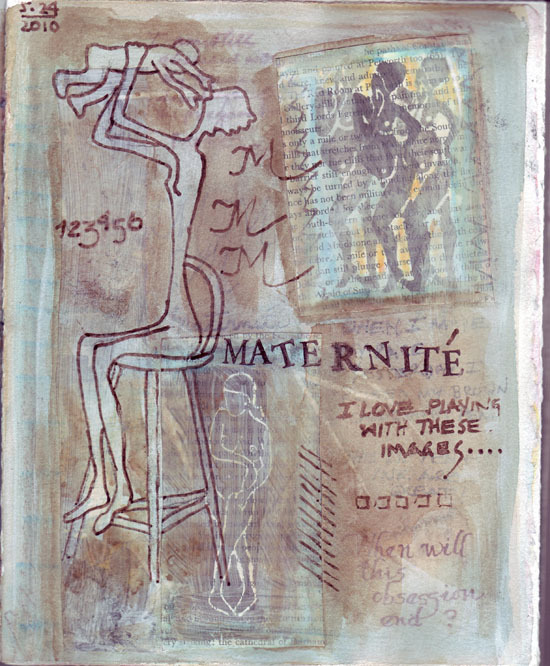 My Maternite page has several of my pregnant model stamp images which I cut out and added as collages and the drawing of mother and child on top. Both drawings were done with acrylic ink and a dip pen. The next page is a double spread and will need to be photographed, not scanned, so I will probably add it within the next few days.